The National Writing Project is once again sponsoring the Why I Write project. If you are at all connected to social media, you’re likely aware of this initiative. Professional and amateur writers are posting their responses to the question using hashtags #whatiwrite, #nwp and #dayonwriting. As a teacher, I believe wholeheartedly in getting students to write. Getting them to believe in the value of the written word is often slightly more problematic. But of course, they don’t realize how much real-world writing they actually do: the texts, the blogs, the emails, and the FB status updates are all examples of writing and have as much value as the literary essay my grade ten students are currently writing. I’ve been a life-long writer. Ever since I figured out my parents’ little blue Brother typewriter and could start typing out my stories, I’ve been hooked on words. I love their power and their potential to create a world; I love the music they can create, the emotional impact they can have. Even when they frustrate me, I love them. Like many teens, I wrote a lot of sappy poetry in high school. I wrote short stories about boys who broke my heart. I wrote hundreds of letters to pen pals all around the world. Perhaps I wouldn’t have considered those letters ‘real writing’ back then, but each epistle honed my ability to commit thoughts to paper coherently and creatively. 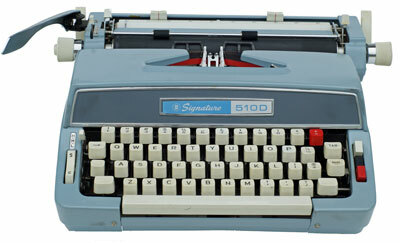 When I graduated from high school, my parents gave me an electric typewriter. Don’t mock me; it was 1979. That thing weighed about 50 pounds and the correction cartridge was bigger than an 8-track, but still – I felt I now had the potential to write the next great Canadian novel. Because that’s what I wanted: to be a writer. Still…I do write. A lot. I’ve written hundreds of pages of fan fiction. I’ve written dozens of newspaper articles. I’ve written feature stories for magazines. I’ve written half of a really dumb novel. (And rewritten that half a zillion more times.) I have close to four hundred posts here at The Ludic Reader. I am inching up on 1000 tweets. I do love that the Internet offers writers the opportunity to share what they’ve written. Community is important. But even without it, I think I’d still write. It helps, sometimes, to just listen to my thoughts and then try to sort them out on paper – or in cyberspace. Writing gives me the opportunity to be more than I am. This entry was posted in 365 Days 2012 and tagged #whyiwrite, interesting stuff by Christie. Bookmark the permalink. I caught your tweet somehow and was exposed to #nwp once again. Last year, I was relatively new to twitter; therefore, did not realize what was happening. Thank you for reaching out and sharing your work and that of your students. When I graduate, I will certainly have #nwp be part of my classroom traditions. It was a lot of fun! There are so many great ideas out there – it’s hard to keep track of them! Thanks for commenting. Writing is also therapeutic. I’ve made it through some of the toughest times in my life by keeping a journal. I would sit down feeling furious and hopeless, but after an hour of writing out my thoughts and feelings, I felt better, somehow. Not “cured,” but quieter, more at peace. Ready to sleep and face the next day, when I would do it all again. It’s the talking cure, even when no one is listening. You continue to be one of my favorite writers. The letters that I’ve received from you over the course of our friendship remain some of my most cherished possessions. I bet those letters are hysterical.